If you have any news or announcements to be posted, please send an email via the Contact Us page. This catalogue features 20 new documentaries, by women and about women. The 2012 titles span the globe and explore timely topics. You can learn about these films and many more by visiting the New Releases page on the WMM website. The 2012 Dortmund|Cologne International Women’s Film Festival has come to an end on Sunday evening with the awarding of its main prize to the Turkish film director Belma Baş for her film ZEFIR. The next edition of the festival will take place in Dortmund in April 2013 in Dortmund. Fri 20 July – Pat Murphy retrospective at the Irish Film Institute followed by Q&A at IFI. Followed by workshop at Trinity College Dublin; proposed title: “Women Making History: Film and Television”. Please contact Ruth Barton (email: ruth.barton@tcd.ie; contact address below) to participate, or if you are engaged in relevant research. She would be grateful to hear from you as to whether you were interested in attending,or whether you had PhD students or others who might be. “ Many of you will have heard that The Women’s Library in London is facing closure and transfer of its collections, or being reduced to operating a skeleton service. London Metropolitan University have decided to attempt to find a new home, owner or sponsor for its holdings, and will reduce the service to one day per week if such a sponsor cannot be found by the end of 2012. At the time of writing, nearly 5,000 people have signed a petition – set up by a concerned member of staff at the University – to save The Women’s Library in its present form…” Read more. Click here to sign the petition, and for more information, see The Women’s Library website. 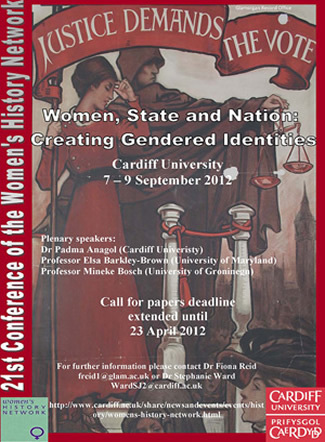 Abstracts of 250 words should be emailed by 23 April 2012 to Fiona Reid (freid1@glam.ac.uk) and Stephanie Ward (WardSJ2@cardiff.ac.uk). For more information, see the Women’s History Network website.